In 1973, he settled in England, taking the Editorship of Resurgence magazine. He has been the editor ever since. He is the guiding spirit behind a number of ecological, spiritual and educational ventures in Britain. He founded the Small School in Hartland, a pioneering secondary school, which brings ecological and spiritual values into its curriculum. He is also the Director of Programmes at Schumacher College, a residential international centre for the study of ecological and spiritual values. 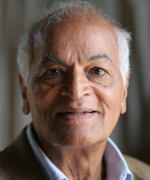 In 2000, Satish was awarded an Honorary Doctorate in Education from the University of Plymouth and in 2001, an Honorary Doctorate in Literature from the University of Lancaster. Also in 2001 he was presented with the Jamnalal Bajaj International Award for Promoting Gandhian Values Abroad. His autobiography, No Destination, has sold 50,000 copies and Satish has three other books in print, You Are, Therefore I Am – A Declaration of Dependence, The Buddha and the Terrorist and Spiritual Compass.